My favorite film of 1996 was not my favorite film in 1996. At that time I was a young man fresh out of high school. I was taking a few college classes but mostly I was working a lot and spending a lot of time reading and watching movies. I must have gone to the movies two or three times a week that year. I was really into action and fantasy films at that point. That year I remember going to see movies like Mission: Impossible, The Rock, and Dragonheart. But a kid of 19 doesn’t know a lot about movies. I liked to think that I had a different taste in film than most people my age. I was into Star Wars like everyone else, but I also counted films like The Maltese Falcon to be among my favorite. As I got older I really started to look beyond the screen when I picked out a movie. I started to see films for more than just what they were about or what actors were in them. I began to pay attention to who the writers were and especially who the director was. I started to realize that who directed a film was just as important, if not more so, as the actors and actresses. So I started re-watching some classics like Psycho and The Birds paying special attention to how Hitchcock constructed his works. I made it a point to go see every film that Quentin Tarantino took part in, from Pulp Fiction to Four Rooms. And I absolutely fell in love with the works of the Coen Brothers. 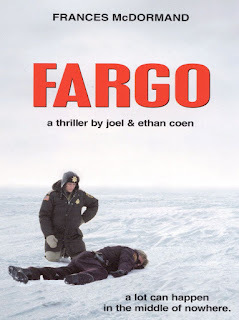 Joel and Ethan Coen are a couple of guys that direct the majority of their projects as a team. They direct the movies equally, but some weird rules make it difficult to give the directing credit to two people so usually one of them is listed as director while the other is listed as executive producer. By 1996 they had already directed a few movies that I really love like Raising Arizona and Barton Fink. They were films that I had seen but didn’t associate them as being a part of each other. But in my early twenties I saw a film that came out in 1996 that put me on a path to call myself a Coen Brothers completest. That film was Fargo, starring William H. Macy, Frances McDormand, and Steve Buscemi among others. Set in the great white northern town of Fargo, North Dakota, this movie is a perfect blend of comedy, drama, suspense, and mystery. At its core it is a murder mystery with a twist…it’s not a mystery to us. We know who the killer is from the beginning. The fun is in watching the lengths that he’ll go to not to get caught, and the resilience of a small town cop that goes the extra mile to catch him. I think that my love for the noir genre of film from yesteryear may have contributed to my love of this. There are definitely a lot of aspects of that. The story relies a lot more on the characters and the dialog than the action. And the actors that they picked for those roles went a long way toward nailing me down. I knew Steve Buscemi from other things like Resevoir Dogs. As a matter of fact, the fact that he was in the film may have been the reason that I decided to watch it in the first place. So, I guess I can thank him for putting me on the scent of a bunch of movies that I’ve loved ever since. I had never seen Francis McDormand before this. But her performance was fantastic. Only the Coen brothers would make a murder mystery where the main cop character is not only a woman…but in the last trimester of pregnancy! She knocked it out of the park. I’ve never doubted her since. When I saw her collecting that statue earlier this year for her performance in Three Billboards I wasn’t surprised. William H. Macy was another one that I didn’t know much about. I had seen him in some TV roles before this, but nothing that really stood out to me. His performance in this movie as well as Boogie Nights from a couple of years later are the gold standard that I compare him to. That may not be fair to him but I know from those two films what he is capable of…a lot. This movie is regarded as a classic among many. They turned it into a TV series a couple of years ago and it has become one of my favorites as well. Especially the first season because it was almost a retelling of the story that was told here but updated and kind of a sequel as well. If you’ve never seen Fargo on FX I urge you to go and check it out. But…go watch the movie first. I can’t guarantee that you’ll like it but there’s a good chance that you will since it’s my favorite movie of 1996.